British Business Bank Group has five shared values. 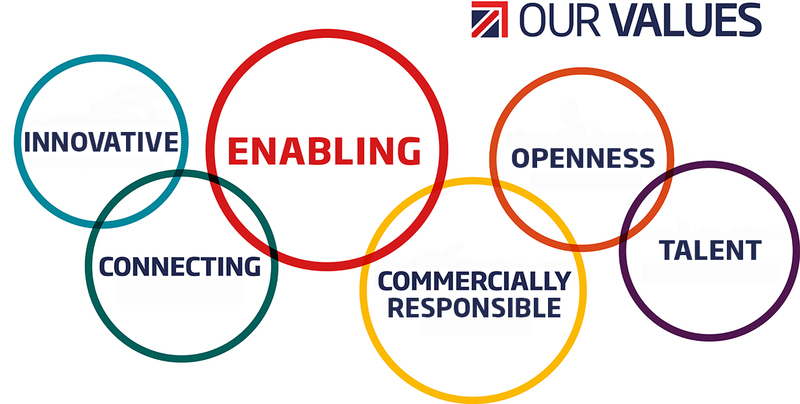 These pillars support and shape our brand, and core essence of ‘Enabling’. Our colleague forum developed these values from the views and input of colleagues across the organisation, based on a ‘bottom up’ approach. They are a foundation for everything we are and stand for as a business, and will positively shape our corporate culture as we grow. The forum meets every other month, with representatives from both offices and teams across the business. They are a voice for and a platform to present, discuss and share good practice on key issues that affect all employees and the way we operate. Our colleague forum also plays an important role in supporting better communication across the entire organisation. What do our values mean for people working at the British Business Bank? With an over-arching ethos of Enabling, our values guide and inform all aspects of our work. We harness our talent to help UK smaller businesses to get the funding they need to start, grow and prosper. We are proud of our brands and passionate in the design and delivery of products and solutions that make finance markets work better. Connecting teams across the group and collaborating with Government, chosen partners, customers and our wider network to deliver funding, support and improve financial markets for smaller businesses. We respond with flexibility and agility to drive the development of solutions that challenge our way of thinking and improve our ability to positively impact financial markets. We have a shared sense of purpose, openness and integrity in serving our market, stakeholders and colleagues. Exercising good commercial judgement, we work responsibly with taxpayer resources to deliver economic and social benefit. We are a diverse community where talent is recognised and nurtured, and colleagues feel empowered to be proactive in their own development.